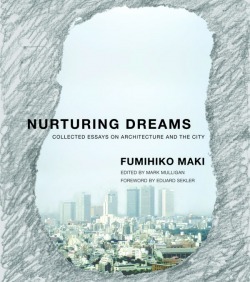 Book Review - F.Maki "Nurturing Dreams"
"Nurturing Dreams - Collected Essays on Architecture and the City"
Fumihiko Maki is an architect renowned for his buildings as well as his writings and teaching. His recently published book “Nurturing Dreams”, edited by Mark Mulligan, is a compilation of original writings, re-writes, excerpts and new pieces written specifically for the publication, written primarily by Fumihiko Maki alone, but also with some text co-authored by Mark Mulligan. All translations from original texts in Japanese were undertaken by Hiroshi Watanabe, excepting those written originally in English. The book illuminates Maki’s thinking on architecture and the city, presenting a discourse relevant to discussion of the nature of the contemporary city. For those interested in Sydney as the major Western city within the Asian region, the body of thought in the book is invaluable as a compilation of ideas about the city originating from both Western and Asiatic backgrounds. Whilst Sydney’s design originates from European (specifically English) roots, with overlays of North American and Australian urban planning ideas, its contemporary built environment is being increasingly influenced by Australia’s integration into Asia and the “east-Asian tiger” economic model which underpins the region. One needs only to look at the chaotic character of some of Sydney’s quickly grown urban sub-centres to see a parallel to that of Tokyo’s rapid post-war reconstruction centred around dispersed railway stations. It comes as no surprise, for example, that Sydney’s Bondi Junction, a chaotic regional sub-centre built up around a rail head, provides a comfortable home for some 25 Japanese sushi bars & restaurants and other Japanese homeware stores. Historically, the characteristics of the Asian city are quite different to those of western cities. As Maki points out, “After all, whether laid out as grids or networks, Japanese cities are intrinsically Japanese, and Western cities, Western.” The book is an indispensable primer for those wanting to understand both a Western and Asiatic outlook on urban planning, and how the completely different traditions can be reconciled. Maki comments in the book on the fascination within Japan with the designs and writings of Le Corbusier who built only one late work there, equally Maki’s writings and built work have held the fascination of Westerners trying to understand the East. Fumihiko Maki has had the unique opportunity to develop ideas about placemaking in Japanese cities, watch them applied, and then refresh them for a new wave of design and construction. Long time observers of Sydney have also seen successive development booms, lulls, periods of substantial growth and stagnation. Fumihiko Maki can offer his Sydney readers mentoring in positioning, theorizing, and practising ideas for urban and architectural design and construction in an holistic manner. Regrettably, in the current Australian architectural scene, there are just too many new buildings which obsess with detail without contributing to the character of place through appropriate scale, materiality, composition, image, and contribution of a humanistic sensibility. Maki offers a lesson in interpreting order from chaos, an interpretive skill long required of Tokyoites, now increasingly required Sydneysiders in negotiating access through and across their city and even within their local neighbourhoods. The book is essential reading for students and practitioners of architecture, particularly those who have not had the good fortune to study, work or have direct contact with the Japanese master. Being published in English, the book is oriented to the Anglo-American west, with a broader international English readership in mind. Maki is one of the few Asian-based Asian architects who have truly been able to cross the east-west cultural divide, to develop themes in his intellectual and physical works meaningful to both eastern and western audiences. In these writings Maki skilfully blends concepts of Japanese space and aesthetics with ideas drawn primarily from North and South American and European observations. This presents a specific cultural perspective that could only have its origins in Tokyo. Sekler also tactfully points out that Maki’s “essays were not written by a professional scholar or scientist but by a thoughtful, sharp-eyed architect and urban designer”, and that they “have been accepted with greater attention … coming from an author backed up by an impressive record of professional achievement”. The book’s first part “Formative Years” is written specifically for the book, incorporating passages from previous essays. Maki recounts the 50 years form when he left Japan to study in the US, and his experience at Harvard GSD as a student and a teacher. Part 1 is an autobiographical personal history concerning Maki’s life in the 1950’s and 60’s, including experiences studying and teaching in the US and travelling through the Americas, Asia, Middle East and Europe, and his participation in the Metabolist movement. Part 2 focuses on studies from the period which culminated in the 1964 publication of Maki’s seminal “Investigations Into Collective Form”, and more recent reflections on those early studies. Maki was interested in developing a single coherent theory beyond that of single buildings, which would move beyond the perpetual endeavour “how one can create perfect single buildings” and as well develop a “spatial language to make meaningful environments”. Part 4 discusses themes of modern architecture, influential modernist figures in Maki’s encounters and those that mentored him, some of Maki’s built work, and again, more of his direct experience in the practice of architecture in Japan. In reading this book one can’t help feeling that what has not been said may be as important as that which has been said. This reading of Maki’s personal and professional history via the publication of a group often autobiographical texts passes over some salient points worth further illumination. In the midst of the devastation of immediate post WWII Japan, how did a young man be so open minded as to go to study in his nation’s former foe, the USA? What family did he arise from that was so well educated and positioned to enable him to travel abroad and back and forth for so many years. What was this family and background in Japan which enabled him to commence a flourishing practice immediately on return to Japan? While this social history within Japan is not touched upon by the book, the dream of academic, intellectual and professional achievement remains nurtured without grounding that dream with a realistic recounting of the social history of this architect. I welcome a further edition of Maki’s writings from a publisher positioned out of the north-American mainstream, in a condensed format which could be easily carried in the backpack or “mochila” of architecture students and young architects, as they travel from city to city and building to building, following Fumihiko Maki’s dream and the great education it can offer. This new edition would tell as well the remaining half of the story which has not been told, so that we truly do understand the origins of Maki’s success, more of the nature and history of Japan, the political climate in post WWII USA which nurtured Maki’s early career, and the reconciliation of Eastern and Western ideas through Maki’s writing and through his urban design and architecture. Such a book might also offer a better critique of where the theories put forward by Maki stand today, now tried, tested and reconsidered. How have Maki’s ideas dated, endured, and what is still relevant today? With such additional text from which to learn, many more dreams for the city might be able to be nurtured.